Lists organize your thinking, focus your energy, free up time in your day (and space in your brain), and give you confidence. No wonder everyone loves lists: making them, reading them, checking things off on them. Most books of lists feature facts, statistics, or trivia. 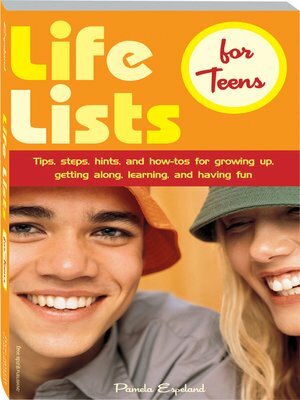 Life Lists for Teens is different. It's not about the tallest this or the weirdest that. Instead, it's a user's guide to life. Over 200 powerful self-help lists distill "big topics" like health and wellness, relationships, feelings, creativity, personal safety, school, self-esteem, and problem-solving. Each list is like a mini self-help book—a starting-point for learning, thinking, and making positive choices and decisions. Some of the lists are practical: 6 Ways to Remember What You Study, 12 Tips for Making and Keeping Friends, 3 Rules for Doing Internet Research. Some are meant to motivate or inspire: 10 Goal-Setting Steps, 18 Great Reasons to Serve Others. Some are serious: 8 Tips for Coping with Tragedy or Disaster, 9 Symptoms of Major Depression, 10 Ways to Handle Hate Words and Slurs. And some are just for fun: The 8 Clown Commandments, 9 Tips for Changing Your Hair Color. Any teen who has ever made a list will enjoy this book—as an inviting, enlightening read, a place to go to for quick advice, and a ready source of guidance and encouragement for all kinds of situations. These are lists that matter and teens will use them every day.